Chronicle Books - Free Shipping + New For Spring! Chronicle Books is having a special promotion right now for web orders. If you purchase $30+ on their site, you are entitled to free shipping. Here's a few items that I suggest checking out while you're visiting thier site. Many items that are great for working girls too, like fun stationery and organizers from Angela Adams. If you'd like to read more about what working girls need, visit my column this week at GKFA. 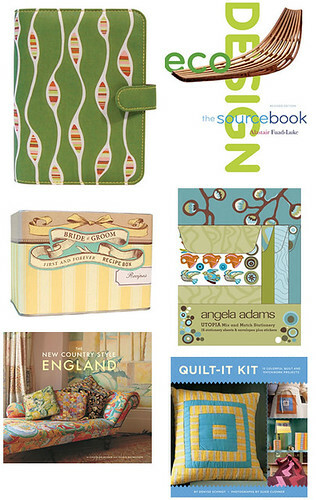 Fresh finds from Chronicle Books...A lovely Angela Adams stylish organizer in fabric for $22.95, ecoDesign The Sourcebook by Alastair Fuad-Luke $35, Bride & Groom first and forever Recipe Box $16.95, Utopia mix and match Stationery by Angela Adams $8.95, The New Country Style England by Chloe Grimshaw and Ingrid Rasmussen $40 and finally, Quilt-It Kit with 15 colorful quilt and patchwork projects by Denyse Schmidt $22.95. See how quickly $30 can add up? Remember, the free shipping offer expires on June 30th.